Obituary for Maria A. (Eisele) Schott | Thomas Funeral Home P.A. 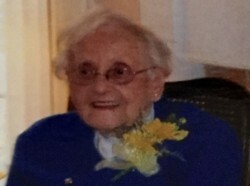 Maria A. Schott, 99, of Linkwood passed away on Wednesday, September 12, 2018 at her home. She was born near Aalen, Germany on December 3, 1918 and was a daughter of the late Gottlieb and Maria Lopsinger Eisele. Mrs. Schott was raised on the family farm and on January 1, 1952, she married Otto Schott, who passed away on August 29, 1997. They were married in Germany. In March of 1952, she moved to the United States and has lived on the family farm since then. She was the oldest living member of Immanuel United Church of Christ and a member of the Women’s Guild. She is survived by two daughters Rosemarie Harper and husband George of East New Market, and Attilie Kilmon and husband Arthur of Pocomoke City, three grandchildren Ann Marie Householder and husband Bryan of Heath, Ohio, Juli Haines and husband Andrew of North Carolina and Matthew Kilmon and wife Camille of Pocomoke City, three great grandchildren Otto and Kathryn Householder and Asher Kilmon, a sister Elsa Clara Schnoor of Cambridge, and several nieces and nephews. Besides, her parents and her husband, Mrs. Schott is preceded in death by four brothers Friedrich Eisele, Gottlieb Eisele, Otto Eisele and Wilhelm Eisele. Pallbearers will be Matthew Kilmon, Max Schnoor, Freddie Schnoor, Chem Albites, Andy Haines, Bryan Householder, Chris Schnoor and Andrew Schnoor. A funeral service will be held on Monday, September 17, 2018 at 11 am at Immanuel United Church of Christ with Pastor Dale Krotee officiating. Interment will follow at East New Market Cemetery. Family will receive friends one hour prior to the service. In lieu of flowers, memorial contributions can be made to Immanuel United Church of Christ, 5401 White Hall Road, Cambridge, MD 21613 or to Coastal Hospice Foundation, P.O. Box 1733, Salisbury, MD 21802. Arrangements are in the care of the Thomas Funeral Home, P.A. in Cambridge.